— Meeting attendee claimed route would infringe on his constitutional right to enjoy his property. — Claims of property devaluation was countered by research which shows cycle routes can increase house values. — Route may already be cut short to only cover from Terenure to Ballsbridge. A public meeting last Tuesday to discuss a proposed Quietway — a type of cycle route using streets with low volumes of traffic — was preceded by the circulation of a leaflet with misinformation that half of the car parking space on two streets along the route would be removed. A consultant’s report on the feasibility of the route, which was made public before the meeting, actually recommended retaining the parking on the streets in question. The anonymous leaflet with was circulated to residents on the day of the meeting included details of options which were not recommended to be used. “There was concern that half the parking on Garville Ave and Cowper Road would be removed. 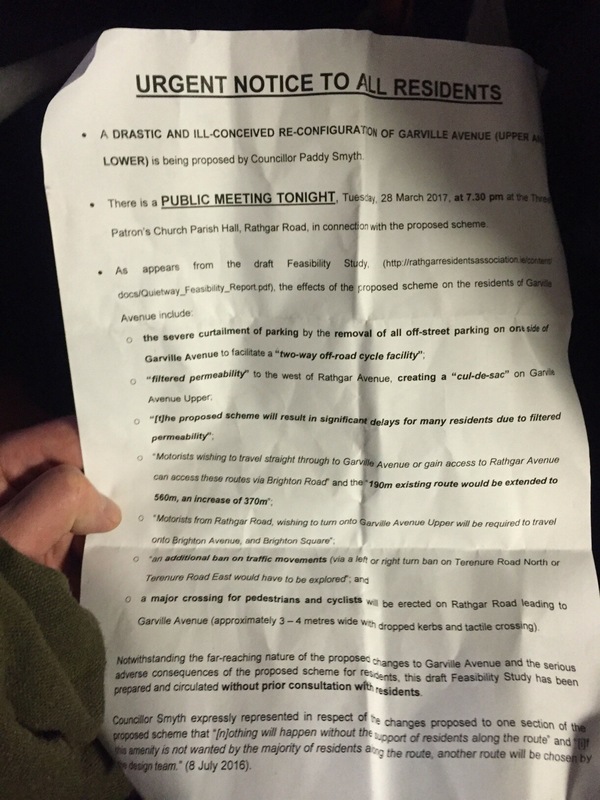 This was down to flyer circulated prior to the meeting which quoted selectively from the feasibility report, which looked at all options available, but failed to mention that the report categorically came down in favour of no loss of parking on these roads and only filtered permeability in their recommendations,” said Cllr Paddy Smyth (FG). Filtered permeability is a very common design in the Netherlands (pictured) and it is also common in some parts of UK cities, where it has been installed by opening gaps in walls or closing off streets and roads to through car traffic. According to a number of attendees of the meeting, the event was marred by people complaining about fears of loss of parking even where no plan exists to cut the number of parking spaces on their streets, and legal threats against the councillor who organised the meeting. It was claimed by one or two attendees of the meeting that measures on the walking and cycle route which would restrict through traffic on streets would be an infringement of constitutional rights for people to enjoy their property, due to some detours to local access routes for motorists. The leaflet (see image, below), tilted “Urgent notice to all residents” said that a 190 metre route for motorists would be extended to “560m, an increase of 370m” — this relates to the installation of bollards or planters to cut through traffic on residential streets, a measure which is proposed along the Quietway route. The consultant’s report recommended a number of possible interventions — including bollards to stop rat-running motorists and allow for filtered permeability, raised crossing over side streets, and new crossing where the route meets busy roads. Cllr Smyth said the meeting was a “tough gig” and he was threatened personally with legal action — he thinks the hostility was partly because of the misinformation but also due to other factors such as a bias in the age group of attendees towards older residents rather than younger parents. This was echoed by parents and others who complained to this website that the meeting time of 7.30pm on a weekday would not suit them, others said they just had not heard of the event. Cllr Smyth said that route is still achievable, adding “but in what form I don’t know” — that will likely depend on the overall level of public and political support for the project. Campaigners in London have complained that some recent Quietway routes are of low quality mainly because they fail to cut rat-running traffic which resulted in heavy motoring traffic remaining on the routes. As we reported last week, a proposal to make a gap in the wall between Corrib Road and Ashdale Gardens to allow for filtered permeability for people walking and cycling was strongly opposed Ashdale Gardens residents. Because of this, the route will now likely start in Terenure and not the neighbouring area of Kimmage, as originally envisaged. Sad ,seems to be someone spreading Black Propaganda on purpose and not giving their Name, why.There is some Motorhead not wanting to change anything. I would think making the Roads safer is more important than Cars speeding and also Rat Running through their Locality. Lots of Elder people living all around Rathmines and Terenure and Kimmage, You would think they would be glad of this initiative to give them peace to walk in comfort without having the Hazard of Cars speeding and Ratrunning through the district. As for Parents with Children it is vitally important to have quiet streets without the danger of cars constantly passing through. It is a win win situation.The Organisers should have given plenty of advanced notice of this meeting taking place though. When you try to introduce change, people are always pessimistic about how they will be impacted. It can be hard to see the benefits when the loudest voice is shouting about all the possible problems, without the need for hard facts. what I don’t get is how this scheme came about in the first place how does one get the council ot commission a feasibilty study on it? @dublinstreams I’m guessing, become a councillor and get agreement at committee level? “proposal to make a gap in the wall between Corrib Road and Ashdale Gardens to allow for filtered permeability for people walking and cycling was strongly opposed Ashdale Gardens residents” why is this not going ahead? To get more of the young families who’d benefit from this, what would be the best time and day to call the next meeting? All of the houses on Corrib Road were built for Guinness workers and their families in the late 1940’s. Guinness also built 22 houses on Melvin Road and 24 on Derravaragh Road. Hard to say why there’s reluctance from some residents to break down the wall.